396-164 Which Shape Features for Studying Shape Deformation and Performing Shape Classification? 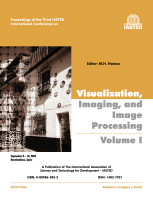 Volume I This publication covers the following topics: animation; computer vision; human-machine interfaces; image acquisition and calibration; image coding and compression; image registration; image processing and analysis; and medical imaging and image processing. Volume II This publication covers the following topics: pattern analysis and recognition; rendering; tracking; visualization; virtual reality and augmented reality; and modelling.